Rainfall is very important for most of us living at Port Levy because it is our only source of fresh water. 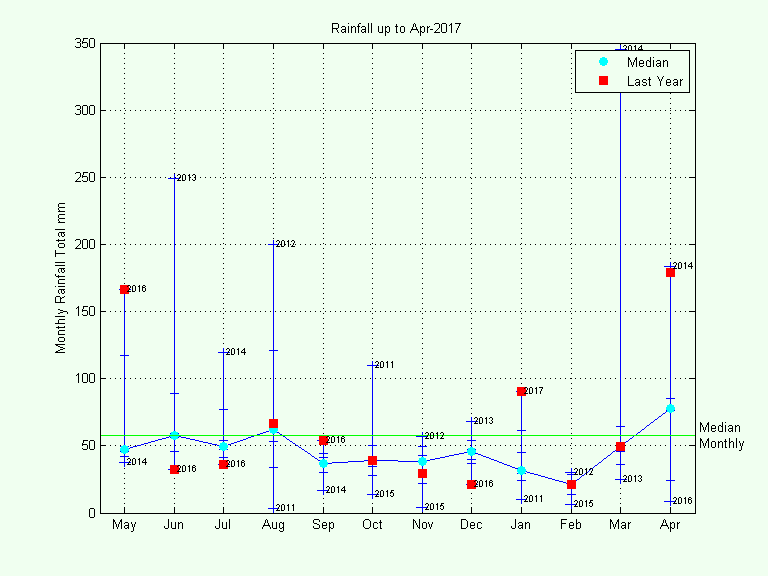 In June 2010, a PWS (personal weather station) was installed at the Mulgor Bach and we now have a substantial rainfall record from which we can draw some conclusions about the rainfall pattern at Port Levy. The plot below shows the rainfall for the last 12 months compared with historical data (from Jun-2010 to present). For a particular month, the total rainfalls for that month for each year from Jun-2010 to the present are plotted as dashes. The year when the maximum and minimum rainfall for that month occurred is noted. The median rainfall for that month for the entire record is a cyan circle. The very large rainfall in Mar-2014 (332 mm) is not an error. It actually occurred and caused flooding with some damage to the bank of our stream. There's a description of the event here. To summarise monthly and annual rainfalls, the median is used in preference to the mean because large departures for a single month (like Mar-2014) can distort the picture. For example, the table below compares monthly means with monthly medians.